I enjoy images that have simple, graphic lines that make up the composition. I was carrying my little Olympus camera when I was walking in Barcelona on vacation this last summer. I was immediately attracted to this scene near Park Guell. The photo is not really about the corner or the staircase (well, OK, it's about that a little bit). 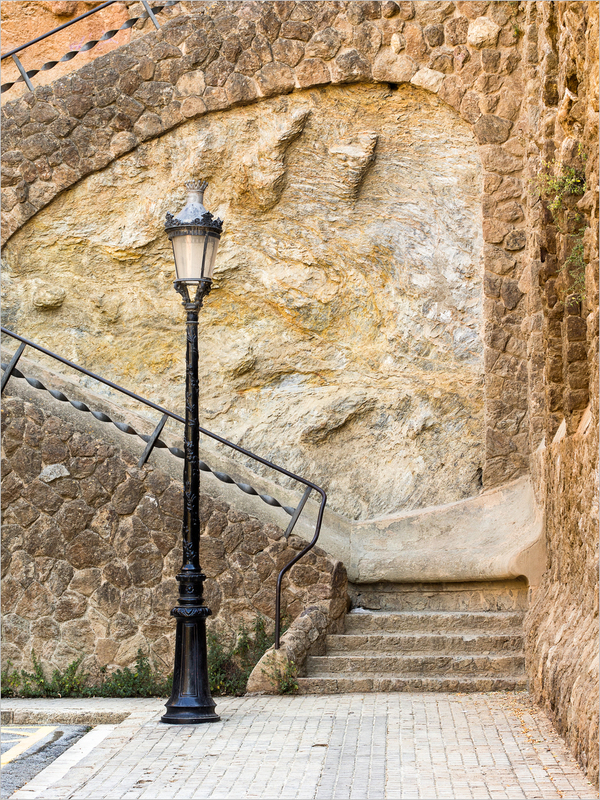 It is really more about the straight lines made by the staircase, banister, corner, and lightpost in contrast to the sweeping curve of stone at the top of the image. "It turns out that for many years the Snake House has been inhabited by squatting artists. Now, in Amsterdam, squatting apparently means something a little different than it does in the US. It means living cheaply and covering costs like heating and electricity, at least from what I can gather. And the artist's living there made the first floor into something of an art and cultural center hosting events for the local community. 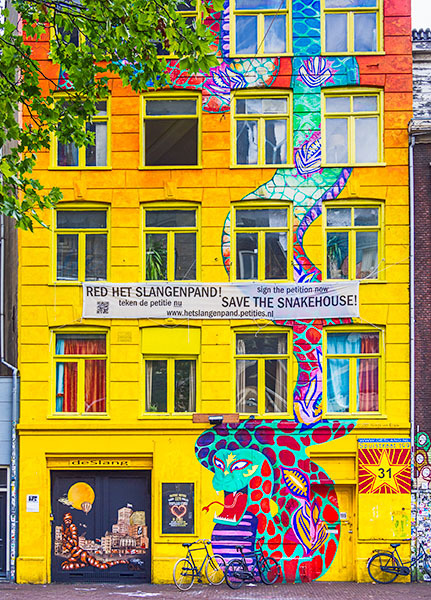 The Snake House is reported to have been inhabited by such squatters for over thirty years, long enough to make the building theirs (believe me, I don't have the slightest idea if this is truly the case based on Dutch law) but in 2010 squatting was made illegal. In 2008 the building was bought by a group that wants to convert it into luxury condos (sound like a familiar story?). The court is apparently set to rule on the issue in January." So, how did the Snake House story end? I tried in vain for many months to find out. Only recently was I able to obtain some information and it doesn't turn out well for the squatting artists. Apparently the squatters lost the court case and the Snake House, as well as some of the surrounding buildings, were to be renovated and turned into 69 condos and 2000 square meters of office and retail space. However, the artist/squatters did not leave without a fight which culminated in 19 arrests. Luckily there does not appear to have been any serious injuries sustained in the stand off. The full details can be found in this article from the NLTimes entitled "Amsterdam Squatter Demonstration Ends With 19 Arrests". As you can see from the image below (from Zack Newmark of the NL Times), the Snake House will not be there on my next visit to Amsterdam. A few days ago I posted an image of a door with urban art from my trip to Amsterdam. But the truth is that the entire building, of which the door was only a small part, was a work of art. Based on the sign however, it seems like the Snake House is in danger! You can visit the website on the sign to find out more (though it really doesn't tell you why people want it removed, only that they want to save it). There was a street that we walked down on our recent vacation in Amsterdam that had amazing and varied ‘urban art’ along it. I couldn’t help but take a few photos! I just returned from a very nice one week stay in the Netherlands. This wasn't a photo trip, but I did bring along my small mirrorless camera and managed to take a few shots while touring. This one is from the walkway on the outside of the Euromast in Rotterdam showing a view towards the Erasmus Bridge. The architecture in Rotterdam was quite interesting and modern (because, unlike Amsterdam, most of the city was destroyed in bombing runs during WW II). When you are in your 50's, when you are a Pink Floyd fan, and when you suddenly find a tribute in your own area.....well, you can't help but post it. This is another in my continuing series of Pittsburgh, PA bridge photos. This one is taken standing on the Smithfield Street Bridge but does not include it in the photo. In this case, my interest was drawn to another set of bridges that could be seen in the distance, looking towards Mount Washington. I was particularly intrigued by the layers of trees, bridges, and tones capped by the houses near the top. by Howard Grill I recently went to make photographs of Pittsburgh's Smithfield Street Bridge and, from a compositional standpoint, found it a bit tougher to photograph than the Clemente Bridge. Of course, sometimes it is merely one's mental state and their receptiveness to seeing that is the issue. I will be making more trips to the Smithfield to see what I come up with. This image is one that I made at the Smithfield Bridge some time ago but never processed. Given my new-found interest, I am going to be revisiting my older bridge images that I never 'did anything with'. Such are the benefits of Lightroom keywording! The bridge itself was designed by Gustav Lindenthal, built between 1881-1883, and was widened in 1889 and then again in 1911. It was rehabilitated in 1994-5. The Smithfield Street Bridge is actually the third bridge to sit at this site, with the first one being made of wood and having burned down and the second being a wire rope suspension bridge that ultimately proved inadequate for the traffic. The current bridge is of the lenticular truss type and is said to be the second oldest steel bridge in the US. by Howard Grill If there is one thing that Pittsburgh has, it is bridges. I have just started exploring the idea of how they might be portrayed photographically. This, of course, is not an original idea, but one that has been played out many times by many people. But I love the architecture, the 'rawness', and the abstract nature of the lines that these bridges make, so I am toying around with how one might get some 'different' perspectives on them as well as what type of processing might work. Here, I went for the 'vintage' look. We will see what comes of these efforts. Well, I stopped by the "Banana Split Festival" in Latrobe, PA a weekend or two ago. "What", you say. Yes indeed.....the banana split was invented in Latrobe, PA in 1904 by David Evans Strickler at the now defunct Tassel Pharmacy. It is well documented. And, this being the 100th anniversary of the invention, there was, of course, a festival! Unfortunately, sometimes bank robbers don't respect a festival..... I was working nearby so I decided to stop and have a quick walk around with my 'carry with' Olympus micro 4/3 camera. I didn't take too many festival pictures, as not too much attracted me from a photographic standpoint. But I did find this brick wall with sign and vine growth inexplicably interesting. By the way, I did use a 25% opacity blended black and white layer on this image as described here. I find colorful murals interesting. You know, the kind that are painted on the sides of city buildings. But I find just taking a photo of the mural a bit dull. Or rather, the photo is only as interesting as the mural itself is, and such a photo becomes, in my opinion, simply a way to display another artist's work. After finding murals that I like, I tend to start to get close and see them in little pieces. I find the abstract look of these small pieces interesting and, though it is still clearly the work of another artist, these photos seem to me to become another way of looking at the mural which is different from being there and taking it all in as a whole. If you have seen my Carrie Furnace Project (get the e-Book), you know that I like photographing old, abandoned places. French photographers Yves Marchand and Romain Meffre have some amazing photos of old abandoned places. Unfortunately, those places happen to be in the city of Detroit. Nonetheless, they are quite stirring and conjure up images of what once was. Photographs from their project "Ruins of Detroit" can be seen here.